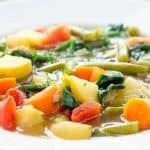 Super simple, light and healthy garden vegetable soup. Using sauté setting- add oil, leeks, and 1/4 teaspoon of salt to pot. Cook for 3-4 minutes, until leeks soften, but not brown. Stir frequently. Add garlic and continue cooking for one more minute. Add all remaining veggies (except leafy greens): potatoes, carrots, tomatoes, green beans – along with bay leaf, salt, and pepper. Add vegetable broth and give a good mix. Lock lid and cook for 5 minutes at high pressure. Once cook time is complete, quick-release pressure. Add lemon juice and parsley and mix well. Finally, add leafy greens to pot and give a good mix to allow to wilt. Serve immediately.